How To Get Rid Of Split Ends – 9 Awesome Remedies That Work Like A Magic To Repair Your Hair! Does a perfect long, silky, split ends free hair exist? Yes! It sure does! You just have to take a small oath that no matter how busy you get; you never fail to take a proper care of your hair. Here is how to get rid of split ends naturally and obtain a gorgeous hair that is absolutely free from breakage! Brace yourselves! Some awesome remedies are here! Before resolving your major doubt of how to get rid of split ends, I would like to put in front of you what causes split ends so that you stop committing the same mistakes that cause the breakage of hair strands leaving a bunch of split ends on your hair. Know What Causes Split Ends? – Because Knowing The Cause Makes The Split Ends Remedy Easy! We are unknowingly subjecting our hair to a lot of harsh treatments! Well, if our hair had a voice, it could speak up for itself. (Sarcasm intended)! Today, I’m going to help you recognize those tiny mistakes so that you act easy and gentle on your hair hereafter! Major Causes Of Split Ends – 6 Things You Need To Stop Doing Immediately! You can go through the list and know how many of these mistakes are actually your lifestyle habits and remember that unless you stop doing this, the home remedies would not help! One of the major causes of split ends is treating your hair with those shampoos that are composed of too many chemicals. 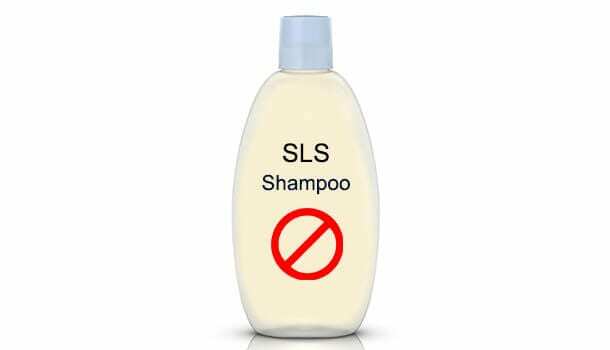 You need to avoid using those shampoos that read sodium lauryl sulfate on their labels because a harsh chemical treatment can make your hair strands weak and lead to breakage. It is best to use herbal shampoos as they are completely chemical free and act gentle on your hair. 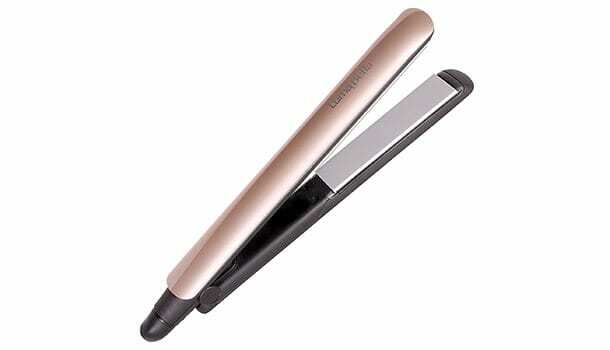 Hair straighteners are the most commonly used heat styling products that cause split ends. Using a hair straightener once in three months can be fine but if you are in a dire need to make your hair look straight and soft, you can use natural homemade ingredients that will make your hair smooth and shiny. Heat styling products can make your hair look perfect for a temporary period but they will bring an irreversible loss to your hair. Try using natural homemade ingredients because naturality is always the best. It is absolutely okay to use hair sprays once in a month but a high chemical composition of hair sprays and gels does not let your hair to grow further, which is the main cause of split ends(1). If you are looking for how to get rid of split ends, there is no choice but to dispose the hair gels and hair sprays lying on your dressing table (or) you could make use of them once in a month. Your scalp generates new hair strands every day, but when your hair shows split ends, it simply means that these hair strands break and split into two as they reach the end or the tip. 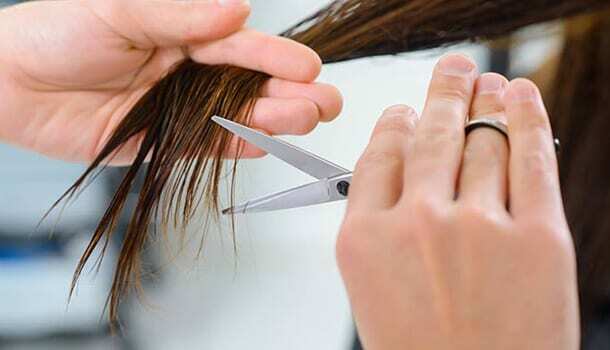 A regular trimming is a basic step one can suggest you so as to get rid of split ends because, if you do not discard the split ends of a particular hair strand, it remains as such which does not in turn encourage the further growth of hair. So, there you go! A regular trimming at least once in 6 months is the best split ends remedy that will assist in healthy and long hair growth. 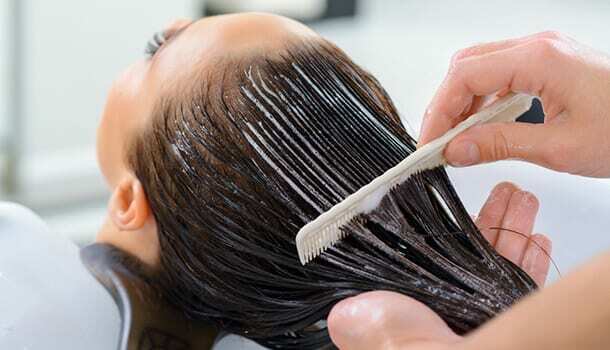 One major reason why health care professionals suggest you to condition your hair after a hair wash is to help you obtain a silky hair that is tangle free. When you leave your hair without conditioning it, you might have to comb your hair a little harder which may wreck your hair and cause breakage. One the bright side, applying a proper conditioner to your hair can make your hair smooth and easy to comb, so that you do not have to be too harsh on your hair to remove the tangles. It doesn’t matter how much in a hurry you are! Combing your hair without properly drying is one of the most common causes of split ends. Ensure that you adopt some natural methods to dry your hair before you make an attempt to comb your hair. Also, make sure that you keep your hands away from your hair as much as possible because running your fingers through your hair strands can weaken the roots of your hair and cause a hair fall. How To Get Rid Of Split Ends Without Cutting Hair? Well, to be honest, you cannot really get rid of split ends without cutting your hair! Because, once the tip of your hair has split into barks, there is nothing you can do other than discarding the ends of hair that serve no purpose. I can assure you that you can regrow strong and healthy hair once you discard your split ends because once the split ends are gone, your hair strand is no longer lifeless and it can grow back thick and strong based on the treatment you give. The first step you need to follow to get rid of split ends to cut your split ends(2) and remove them completely. 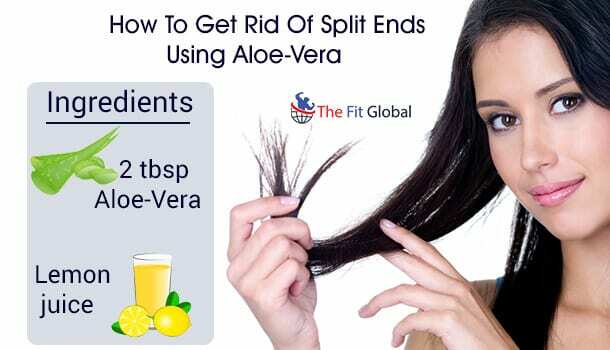 Now you can follow some best remedies and follow the best preventive measures to get rid of split ends. So, here are the nine best home remedies for split ends that will work wonders for preventing the split ends and making your hair look strong and free of damage. You can choose any two remedies for the first week and continue to switch to other remedies from the next week. You have to ensure that you are following two remedies a week to prevent any further occurrence of split ends. 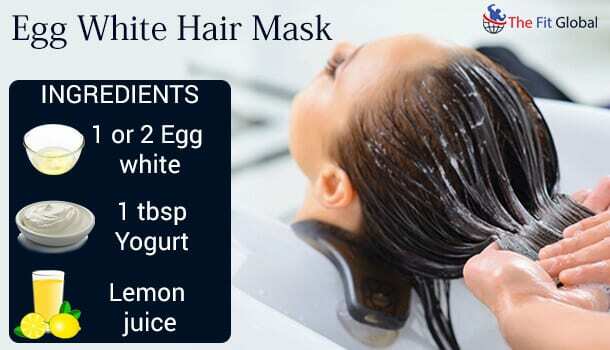 Egg white is a rich source of proteins that helps in the growth of hair right from the root and allows the hair strands to grow long and strong without causing any breakage. 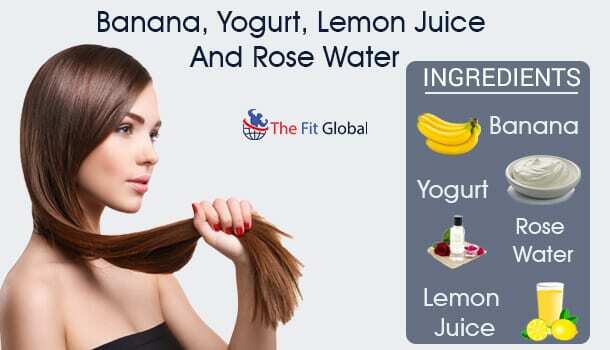 Adding yogurt to this helps in the growth of a smooth, tangle free hair so that a constant combing does not let your hair strands to break thus preventing the split ends. Beat one egg and extract the egg white from it carefully (ensuring that you do not let the yolk to get mixed with egg white). Add yogurt to this and squeeze the fresh juice of half slice of lemon into this. Mix the ingredients well and apply the paste all over your hair covering each hair strand from root till the tip. Apply the conditioner and give it a final rinse. 2. How To Get Rid Of Split Ends Naturally Using Coconut Oil? Applying oil to your hair is a must when you are looking for a split ends remedy. Coconut oil contains all the essential oils and vitamins that work the best in nurturing your scalp and hair strands. 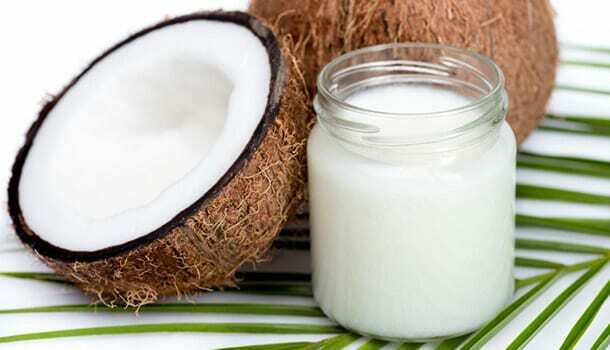 You must essentially apply coconut oil at least thrice in a week if you wish to get rid of split ends soon. Applying hair packs without applying coconut oil may not help in preventing the split ends. For the best application of coconut oil, you can heat the oil to a certain temperature and use this oil to gently massage your hair strands for at least 15-20 minutes. Ensure that the oil is not too hot because an intense hot treatment can again cause split ends to appear. Heat three to four tablespoons of coconut oil in a bowl. Let it become slightly warm (warm enough to be applied to the scalp and hair). Use your fingers to massage the oil such that it gets embedded properly into your scalp and your hair strands. Let it sit on your hair overnight. You can apply a hair mask the next day on the morning and go for a hair wash after one hour of application. You can change your preference to castor oil instead of using coconut oil each time you apply oil to your hair. 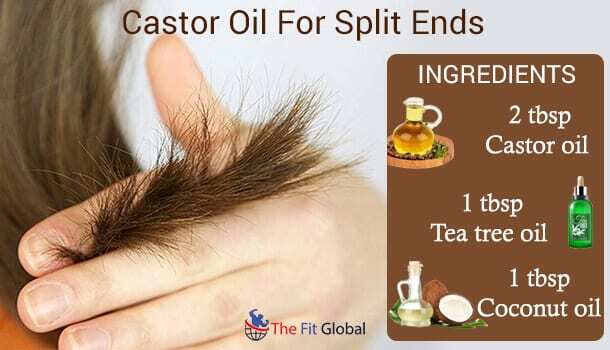 Castor oil is an age old remedy that has been put into use as a remedy for thinning of hair or a severe hair loss. 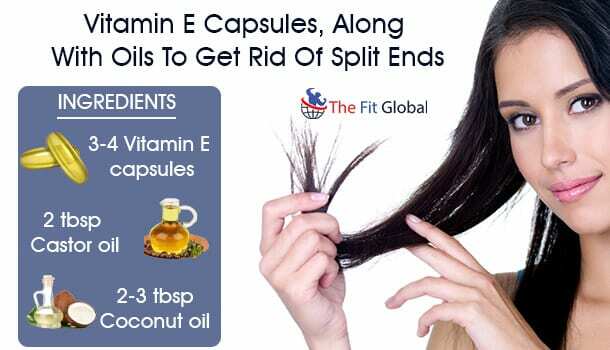 The presence of the most important vitamin for hair growth (vitamin E) along with other essential acids makes it the best remedy for the regrowth of hair and prevention of split ends. Take castor oil into the bowl and add tea tree oil and coconut oil to this. Mix the oils well and heat the mixture for 5-10 minutes before directly applying it to your hair. Do not overheat the oil as overheating can strip away the natural properties of the oil. Use your fingers to massage the oil gently into your scalp and hair strands making sure that you cover each hair strand from root to the tip. Let the oil remain on your hair overnight and rinse this off next day in the morning. Aloe-Vera is the best moisturizing agent as it contains excellent cooling properties. Being enriched with proteolytic enzymes is the best medicinal property of Aloe-Vera as this helps in repairing the scalp and hair strands by removing all the dead and damaged cells. Also, Aloe-Vera makes your hair smooth, soft and tangle free which lets you comb your hair easily. This can prevent split ends because when your hair is devoid of tangles, your combing becomes hassle free! Extract the gel from Aloe-Vera into a bowl and add lemon juice to this. The gel of Aloe-Vera may be too slimy and sticky. You can use hand gloves to separate the gel from the leaves. Add lemon juice to this gel and mix the quantities well. Apply this mixture to your scalp and hair strands using a brush. Let the mixture remain on your hair for one hour after which you can rinse your hair with cold water using a good compatible shampoo and a suitable conditioner. Vitamin E oil is an excellent beauty product. It helps you resolve all the major skin and hair problems since the oil is supplemented with high number of antioxidants. Using mustard oil and coconut oil to this can give you a gorgeous hair, free off all the breakage and damage. Crush the capsules to obtain the powdered form of vitamin E.
Add castor oil and coconut oil to the vitamin E powder and mix the ingredients well. Apply the mixture all along the length of your hair strands and give your scalp a good massage for 15 minutes with the help of your fore-fingers. Let the mixture remain on your scalp overnight. You can use a shower cap for covering your hair before giving your hair a final wash.
Use a good shampoo and a suitable conditioner to treat your hair after a hair wash.
Mustard seeds are an excellent source of vitamin A which helps in the growth and nourishment of your hair. Mustard seeds can be easily bought form your nearby stores but you have to soak the seeds the night before applying the hair mask. Blend the seeds in a mixer and grind them until they are completely crushed. Add yogurt to this mixture and mix the ingredients well so that a smooth paste is formed. Use a brush to apply the mixture all over your hair and cover your hair with a shower cap. Let it remain on your hair for one hour after which you can rinse your hair with cold water. Make sure to use a shampoo that is free of sodium lauryl sulfate to rinse your hair. Bananas are a great source of vitamins and minerals that will help the best in nourishing your hair, thereby preventing the damage and formation of split ends. You can add lemon juice and rose water to bananas so that a smooth paste if formed that is good enough to be applied to the hair. Apply the mixture to the hair with the help of a brush and be sure to cover each and every hair follicle from root till the tip. Let the mixture remain on your hair for one hour after which you can go for a hair wash with cold or lukewarm water and use a good conditioner. 8. How To Use Beer To Get Rid Of Split Ends? Beer is said to be prepared from the malted barley and other sugars that help in protecting your hair from damage and it is also said to help in the growth of hair due to the presence of vitamin B complex in it. How To Apply Beer To Hair Strands? For making the process of application much convenient and easy, you can store beer in a spray bottle to use this for future purposes. Spray some beer on to your hair strands and scalp and use your fingers to spread the beer to other parts of your hair. Let it remain on the hair for 2-3 minutes after which you can give your hair a final wash.
9. 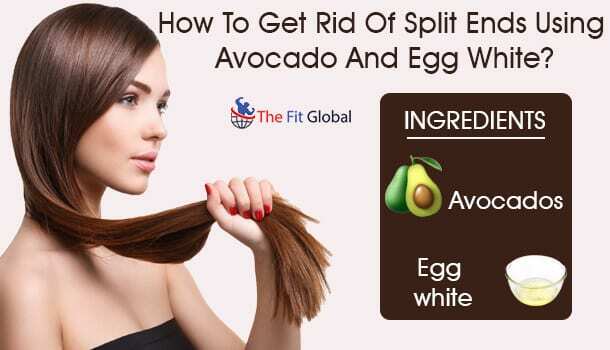 How To Get Rid Of Split Ends Using Avocado And Egg White? One main reason why most of the people use avocado to get rid of split ends is that it contains mono saturated fats that play an important role in making your hair strands strong and damage free. Adding egg white to this can be an added advantage because of the rich protein content of egg white. 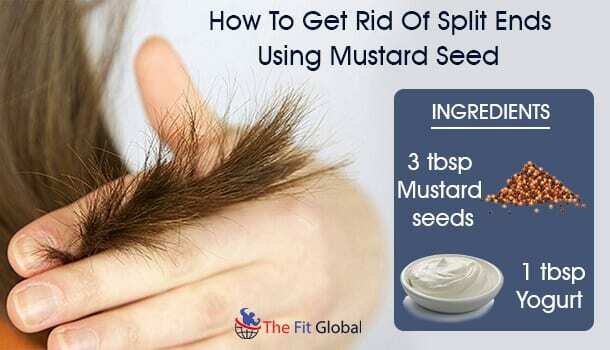 This works as one of the best home remedies for split ends when followed twice in a week. Peel the outer layer of the avocados and collect the inner pulp of the fruit. You can use a spoon for an easy extraction of the green colored pulp. Add egg white into this and mix both the ingredients until a smooth paste is formed. Apply the paste all over your scalp and hair and use your fingers to massage the paste onto your scalp in a circular motion. Let the mixture remain on your hair for one hour, after which you can rinse your hair with a suitable hair wash and apply the conditioner. Preventing split ends and restoring your gorgeous, long break free hair can be effortlessly done if you are willing to make some simple lifestyle changes(which are some of the main reasons for the formation of the split ends). How To Prevent Split Ends – 10 Best Tips! Use only a wide toothed comb to untangle your wet hair soon after you wash your hair. Avoid using heat styling products(3) like hair straighteners and blow dryers as excessive heat is what essentially causes split ends. Wash your hair only with cold water as hot water can strip away all the natural oils from your hair, making it dry, scaly and leaving behind split ends. If you cannot really use cold water, you can use lukewarm water to rinse your hair. Protect your hair from sunlight and pollution by using a scarf or a muffler whenever you have to step out. Trimming your hair once in six months is very much essential as this helps you get rid of all the split ends and promotes a healthy hair growth. Do not comb your hair several times in a day as this may cause breakage to hair strands. Do not be harsh while untangling your hair. Use a soft bristled, round hair brush that can glide through your hair easy and smooth. Plate your hair or tie a simple, easy-to-do bun before going to sleep. Make sure you do not leave your hair open while sleeping. Do not choose those shampoos that have sodium lauryl sulfate in them. Go for herbal shampoos instead. Getting rid of split ends is quite an easy task if you choose to spend some time on a good hair care regime. You just have to know the dos and don’ts and some best home remedies for split ends to make your hair, long, smooth, silky and break free! Following two remedies per week and knowing some best preventive measures is the secret to achieve a beautiful hair that is free of damage.